Things just keep getting better for Orange. 2007 ended on a high with Jimmy Page using Orange AD30TC amplifiers for the Led Zeppelin reunion show at London's O2 Arena, and now 2008 sees the company celebrating its 40th anniversary in style. To commemorate 40 years of citrus-flavoured rocking, the company have announced two limited edition amplifiers - one Custom Shop and one standard production - that hark back to the company's iconic early seventies Graphic amp head. Each Custom Shop amplifier is point-to-point hand-wired with a Plexiglass front panel, and rather than a serial number, each of the 40 limited edition models will have a different girl's name with its own certificate. These look set to become highly sought-after collectors' items. The production model is the 40th Anniversary OR50. As with the Custom Shop model it features a single channel and patent-applied-for eight section output transformers. Other features include an updated version of the HF Drive control that gave the original Graphic heads their unique chime. Foot-switchable master volume further increases the amplifier's flexibility. 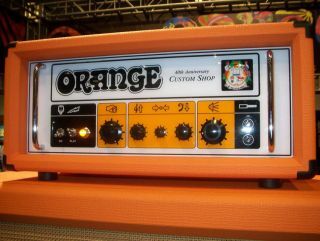 Having heard the Custom Shop version in action at the Orange booth at NAMM we can testify that these are glorious sounding units with articulate, dynamic overdrive in spades. For more, visit the official Orange website.